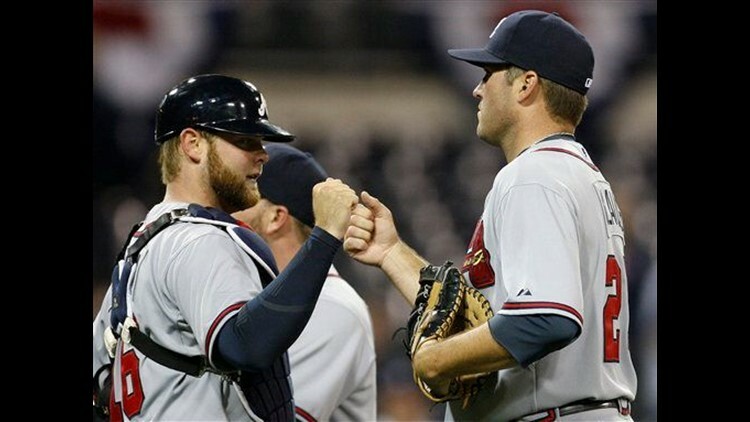 SAN DIEGO (AP) — Tommy Hanson struck out seven in six innings and Troy Glaus hit a three-run homer to lift the Atlanta Braves to a 6-1 win over the San Diego Padres on Wednesday night. Hanson (1-1) held the Padres to one run on four hits, though he walked four and hit a batter as the Braves won for just the second time in six games. Glaus homered off Sean Gallagher in the seventh inning to increase Atlanta's lead to 6-1. It was Glaus' first home run since Sept. 28, 2008 with St. Louis. He appeared in 14 games last season with the Cardinals because of right shoulder surgery. Clayton Richard (0-2) was cruising through five shutout innings before Brian McCann put Atlanta ahead 2-1 with a two-run double with one out in the sixth. Hanson's wildness led to the Padres' only run in the fifth when he hit Richard with one out. David Eckstein followed with a two-out double and Adrian Gonzalez drove in the run with a single. Glaus went deep after Matt Diaz reached on a leadoff error by third baseman Chase Headley and Cesar Ramos walked McCann with two outs, bringing in Gallagher. Atlanta's Martin Prado ran his hitting streak to 12 games with a double in the sixth. Prado went 1 for 5 and is hitting .469 (15 for 32). His 15 hits in the Braves' first eight games is a club record. Headley, who struck out three times, had a single and has hit safely in San Diego's first eight games. Richard allowed three runs on six hits in 5 1-3 innings and lost for the first time (4-1) in seven starts at Petco Park since coming over last season from the Chicago White Sox in the Jake Peavy trade. NOTES: Atlanta's Melky Cabrera and Eric Hinske received their World Series rings from San Diego's Jerry Hairston before the game. Hairston, a member of the New York Yankees last season along with Cabrera and Hinske, flew to New York after the Padres' home opener on Monday to take part in the Yankees' home opener and ring ceremony on Tuesday. Because the Braves would be in town, Hairston brought back championship rings for Cabrera and Hinske. ... Gonzalez, a two-time Gold Glove first baseman, committed his first error of the season. Gonzalez had just seven errors last year and six the season before in winning consecutive Gold Glove awards.